Unjami Festivals are held in northern villages during the seventh month of the lunar calendar, after the observance of Obon. 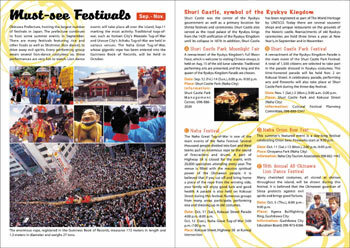 The special feature of this festival is that women perform it. Kouri Island, where the most important Unjami festival takes place, is located in the northeast off Unten Port in Nakijin. Kouri is traditionally believed to be the place where gods created the people of Okinawa. During Unjam,i after the end of each yearly harvest, farmers gather together to pray for an abundance of crops for the next year. Unjami is a ritual where deities descend upon priestesses to communicate. This rite that traditionally took on a traditional fishing boat is thought to be the origin of the dragon boat races of Okinawa.